An accomplished composer, conductor and lecturer, Eric Whitacre has quickly become one of the most popular and performed composers of his generation. To date, Whitacre's published works have received thousands of performances and have sold in excess of one million copies worldwide. Over the past few years, his loyal fans and supporters have moved online, spreading Eric's popularity to an ever-expanding worldwide audience. Though he had received no formal training before the age of 18, his first experiences singing in college choir changed his life, and he completed his first concert work, Go, Lovely, Rose, at the age of 21. Eric went on to the Juilliard School, earning his Master of Music degree and studying with Pulitzer Prize and Oscar-winning composer John Corigliano. Of timeless beauty, this composition speaks to singers and audiences of all generations, offering a high point in any concert program. Here are six whimsical settings of Ogden Nash poems that are perfect for a lighter portion of your program or as an encore. They are easily-learned and fun to perform! The City and the Sea is a new collection of five compositions from one of the world's most popular choral composer based on the poems of e.e. cummings. "i walked the boulevard" - White key clusters in the piano create the rhythmic framework for the playful vocals sung in unison declamation or that ricochet one part to another in this vividly portraying an urban street scene. "the moon is hiding in her hair" - This languorous setting features a chaconne-like left hand pattern in the piano along with right hand cluster chords and legato vocal phrases in octaves to create a meditative musical atmosphere. "maggie and milly" - With the characteristic clusters broken into arpeggios for this movement, this playful work features delightful wordplay and simple fun! "as is the sea marvelous" - This tender setting creates an image of the ebb and flow of the sea through pulsating parallel cluster chords in the piano and long legato vocal phrases. "little man in a hurry' - Full of colorful contrasts, this final movement from The City and the Sea dances with fun and humor! The rhythmic wordplay and deconstructed syllables poem hurtle ever faster to the final sudden "stop" for an extraordinary concert finale. Set to a text by William Butler Yeats, "The Stolen Child" was commissioned by the National Youth Choir of Great Britain and The King's Singers to celebrate their 25th and 40th anniversaries, respectively. The chorus represents the voice of "the human child, innocent and naive" while the six solo voices represent the "water and the wild," seducing the children away from the world with the promise of endless revelry and eternal youth. Excerpted from Whitacre's music theater work Paradise Lost "Sleep My Child" for SATB and soloists is marked by delicate, ethereal sounds and purity of tone. Translated as "Night and Gold," this work is a companion work to Lux Aurumque (Light and Gold) with themes, both textual and musical, taken from Lux Aurumque and the composer's music theater work Paradise Lost: Shadows and Wings. In Latin. The powerful fusion of Octavio Paz's Spanish text and Eric Whitacre's musical imagery has made 'Cloudburst a favorite with good high school choirs and beyond in the U.S. and abroad. Of timeless beauty, 'Waternight' speaks to singers and audiences of all generations, offering a high point in any concert program. A Boy and a Girl is a tender, delicate poem put to music by Eric Whitacre. It was commissioned by the 2002 California All-State Chorus. 'When David Heard' uses the text of David, lamenting the slaying of his son Absalom (II Samuel 18:33). It is a major work, with great dramatic moments describing the feeling of a father's loss. 'Sleep' is the collaboration between Eric Whitacre and poet Charles Anthony Silvestri, drawing on the mystical moment between awareness and sleep. 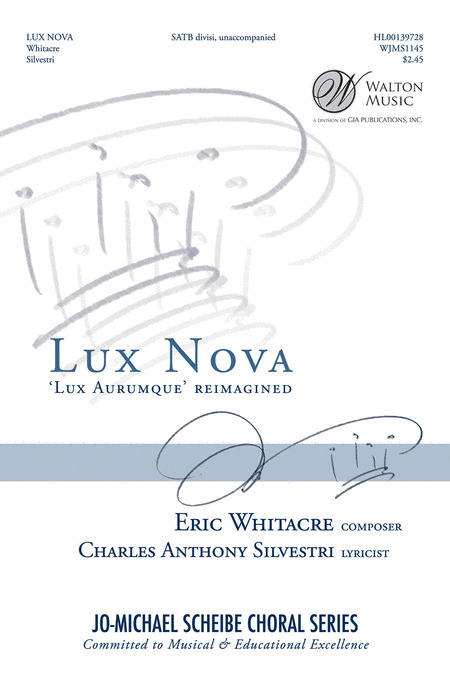 For the setting of Lux Aurumque, Whitacre chose the Latin translation of an Edward Esch poem, enhancing the elegant simplicity of this new work. The text explores Leonardo da Vinci's dreams of flying. The blend of Italian madrigal and contemporary style supports the text, once again, by Charles Anthony Silvestri. in 'Five Hebrew Love Songs - inspired by Whitacre's trip to Switzerland - each song is a "postcard," capturing lush, romantic moments in full. The songs are dedicated to Jerusalem born Hila Plitmann - poet of the beautiful text, and the Whitacre's wife. A simple and delicate setting of the timeless love poem by the Sufi poet Jalal al-Din Rumi, 'This Marriage' marks the first time that Whitacre has written for four-part a cappella chorus without divisi. Composed in the spirit of the Renaissance works written to Elizabeth I - "fair Oriana" - 'Her sacred Spirit Soars,' written for double choir, is in the signature Whitacre style with brilliant choral textures unfolding into a majestic final salute, "Long live, Oriana!" 'Little Birds' is the third setting of words by Octavio Paz (Water Night; Cloudburst) from Eric Whitacre. 'Little Birds' pays homage to Gabriel Faure with its running piano part and fluid sensual melodies. According to the Whitacre "it holds mysterious and magical effects", imitating delicate birds. Suitable for festival or competition use. Go, Lovely Rose is structured around the cyclical life of a rose, and is connected throughout by the opening 'rose motif,' a seed that begins on the tonic and grows in all directions before it blossoms, dies and grows again. Each season is represented. With A Lily In Your Hand is from a prodigious series of poems arranged in thematic "suites," later collected and in 1983 published as Suites. The original poem is titled: Curva. I Hide Myself is a simple little song. All of the musical suggestions come from a careful study of the poem, a quiet, passionate soul occasionally speaking a little bolder than the age will allow. She loves almost to the point of distraction, and this mood must prevail in the performance: shy and sullen, her passion surging to the surface only to sink back into the silence that is herself. Although his name was Jabez Dawes, his character was full of flaws! With an hysterical text by Ogden Nash, Eric Whitacre has brought all of his theatrical skills to this three movement work and tells a wonderful story that will leave parents smiling and young children determined to be even better so as not to meet the same fate as young Jabez. This is a holiday treat for singers, players and audiences. One of the latest hotly-anticipated choral works from Eric Whitacre, Alleluia is sure to be popular with choirs for concerts and liturgical services and events alike. The work simply sets one word - Alleluia - and embodies Whitacre's trademark style. Duration: ca. 10:00. This tender setting creates an image of the ebb and flow of the sea through pulsating parallel cluster chords in the piano and long legato vocal phrases. The powerful fusion of Octavio Paz's words and Eric Whitacre's musical imagery has made this work a favorite with good high school choirs and beyond in the U.S. and abroad. Eric Whitacre composed and recorded this cover of the English band Depeche Mode creating an elegant and spacious sonority that is deeply moving. In this suite - inspired by a trip to Switzerland - each song is a "postcard," capturing lush, romantic moments in full. The songs are dedicated to Jerusalem born Hila Plitmann - poet of the beautiful text, and the composer's wife. 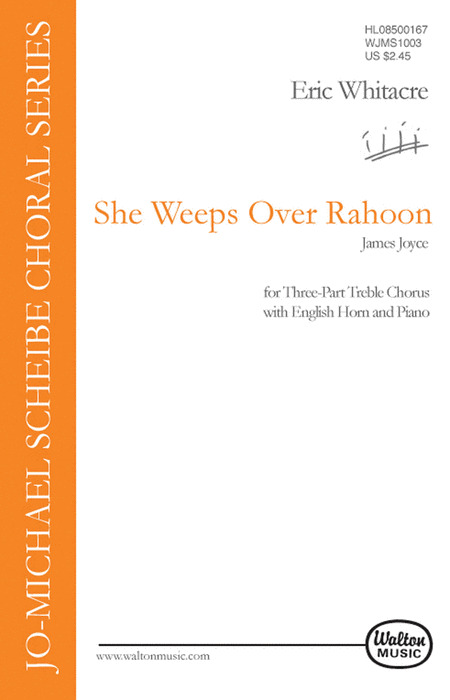 The suite is scored for SATB chorus with either string quartet accompaniment or piano and violin. Eric Whitacre : Godzilla Eats Las Vegas! Eric Whitacre's famous work for concert band, now with optional vocal parts! An original work best described in the composer's own words as being really out there. The writing reflects a keen interest in theater, film and television, with the structure of the piece being very film-like in its very rapid changes of style. A totally unique and very memorable work. The second publication after "i thank You God for most this amazing day" in the set of three Songs of Faith, all to poems by e.e. cummings. Re-issued in 2002 after some minor revisions by the composer. An elegant, stunning piece. The first of the "Three Flower Songs" by Eric Whitacre. This impressive and beautiful work is the last piece in the stunning set of three Songs of Faith, with text by e.e. cummings. To realize the composer's wish to bring his work back to his very first draft, a revision has been made towards the end (page 12). The revised publication herewith replaces the one from 2001. The text explores Leonardo da Vinci's dreams of flying. The blend of Italian madrigal and contemporary style supports the text by C.A. Silvestri. This is the third setting of words by Octavio Paz (Water Night; Cloudburst) from this successful young California composer. Little Birds pays homage to Gabriel Faure with its running piano part and fluid sensual melodies. According to the composer "it holds mysterious and magical effects", imitating delicate birds. Suitable for festival or competition use. The piano part is available separately as well as in the vocal score. Moderately difficult. Full of colorful contrasts, this final movement from The City and the Sea dances with fun and humor! The rhythmic wordplay and deconstructed syllables of the E.E. Cummings poem hurtle ever faster to the final sudden "stop" for an extraordinary concert finale. For the setting of Lux Aurumque, the composer chose the Latin translation of an Edward Esch poem, enhancing the elegant simplicity of this new work. The tight harmonies will need to be carefully balanced by a well trained a cappella choir. Suitable for an advanced high school choir and beyond. Moderately difficult. Whitacre's best-selling Lux Aurumque has been reimagined with a middle section of new material from his musical Paradise Lost. Lux Nova works best with a pure, balanced, shimmering tone with strict attention to the dynamic colors and a slow, luscious pacing. With poetry by Edward Esch translated into Latin by celebrated American lyricist, Charles Anthony Silvestri. With the characteristic clusters broken into arpeggios for this movement, this playful work features delightful wordplay and simple fun! One of Eric Whitacre's earliest choral compositions, this is for treble voices with the accompaniment of English horn. Available: 3-Part Treble. From the composer of the much performed Cloudburst, here is a collaboration between Eric Whitacre and poet Charles Anthony Silvestri, drawing on the mystical moment between awareness and sleep. While the voice range is accessible, Sleep requires a big enough choir to handle the divisi passages. First premiered at the 2001 ACDA National Convention by the Concordia College Choir, Rene Clausen conductor. Excerpted from Whitacre's music theater work Paradise Lost: Shadows and Wings for the American choir Chanticleer, this setting for SATB and soloists is marked by delicate, ethereal sounds and purity of tone. Come thou Wisdom, Gift of Winter - Composed for the Choirs of Birmingham-Southern College Service of Lessons and Carols, this meditative advent work for SATB divisi voices and organ with a Latin text by Charles Anthony Silvestri features chant-like melodies over vocal and organ pedal tones, vivid dissonances and striking dynamic contrasts. Duration ca. 7:20. This languorous setting of the E.E. Cummings text features a chaconne-like left hand pattern in the piano along with right hand cluster chords and legato vocal phrases in octaves to create a meditative musical atmosphere. Here are three whimsical settings of Ogden Nash poems that are perfect for a lighter portion of your program or as an encore. They are easily-learned and fun to perform! This loving and dreamlike work, now available in multiple voicings including SA, TB & SAB, captures the undulating rhythm of a mother rocking her child to sleep. The text is a classic by Rudyard Kipling: Oh! Hush thee, my baby, the night is behind us, And black are the waters that sparkled so green. The moon, o'er the combers, looks downward to find us, At rest in the hollows that rustle between. Magical! Now available for men's voices, this loving and dreamlike work captures the undulating rhythm of a mother rocking her child to sleep. The text is a classic by Rudyard Kipling: Oh! Hush thee, my baby, the night is behind us, And black are the waters that sparkled so green. The moon, o'er the combers, looks downward to find us, At rest in the hollows that rustle between. Magical! Set to a text by William Butler Yeats, this work was commissioned by the National Youth Choir of Great Britain and The King's Singers to celebrate their 25th and 40th anniversaries, respectively. The chorus represents the voice of "the human child, innocent and na•ve" while the six solo voices represent the "water and the wild," seducing the children away from the world with the promise of endless revelry and eternal youth. A simple and delicate setting of the timeless love poem by the Sufi poet Jalal al-Din Rumi, marks the first time that Eric has written for four-part a cappella chorus without divisi. Of timeless beauty, this composition speaks to singers and audiences of all generations, offering a high point in any concert program. Available: SATB a cappella. The new work of young composer Eric Whitacre uses the text of David, lamenting the slaying of his son Absalom (II Samuel 18:33). It is a major work, with great dramatic moments describing the feeling of a father's loss. Re-issued in 2002 after some minor revisions by the composer. The text by Federico Lorca receives dramatic treatment. In English. The second of "The Three Flower Songs" by Eric Whitacre.